With Australia being first-mover to legislate for plain packaging of tobacco products, and given the closeness of our countries, the noise level is rising on what New Zealand’s policy should be. Generally that debate is providing a great deal of heat and very little light. Commentators with backgrounds in public health, sociology, intellectual property law/international law, policy analysis, and politics, not to mention the opposing strident cat-calls of anti-smoking lobbyists and tobacco corporate interests, have all been widely reported. But one voice that has been largely missing from this debate is that of the dark science, economics. Yet economics is the expertise best suited to predict this outcome, being the science that explains dynamic responses in dynamic systems whereas all the other disciplines that have fuelled the debate are directed at steady-state and single point analysis of the problem. So what do economists think will be the consequence of plain packaging on smoking incidence? There is surprising consistency (for economists) that if applied as an independent lever, introducing plain packaging will not reduce smoking but will cause consumption to increase! They also note that the more graphic health warnings required in Canada had not resulted in statistically lesser smoking incidences than in the USA where substantially tamer and less prominent health warnings are required. So they infer that strictures on packaging and labelling are unproven in providing the benefits they are installed to deliver. Even economists serving opposite masters (Jorge Padilla of LECG Consulting funded by Philip Morris International2 vs Howard Reid of Landman Economics funded by ASH – Action on Smoking and Health3) agree that debranding will cause the price of cigarettes to drop, and greater cigarette consumption will result unless a further action (say, a countervailing tax) is taken to restore the original price point. Padilla’s economic models and a simulation experiment predict an increase in consumption of cigarettes of between 2.6% and 16.6%. 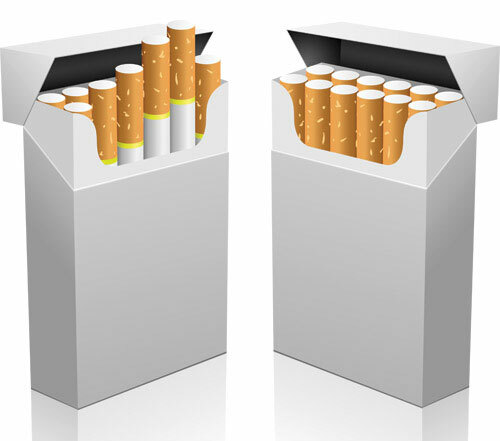 Elsewhere4 Prof. Harry Clarke and David Prentice both from the School of Economics, La Trobe University, have also assessed the economic impact of plain packaging on consumption of cigarettes. The conclusion of their review is “(p)rovided that tax increases offset any induced fall in prices that might result, plain packaging will reduce cigarette consumption.” (emphasis added). In that context, the statement later attributed to Clarke that “…plain packaging package seems at worse to be a costless experiment that provides valuable information on the effectiveness of plain packaging at almost zero public cost.”5 misrepresents their own findings as, consistent with the view seen for every other economist who has studied the problem, they find that pulling the debranding lever alone will in fact increase rather than reduce, cigarette consumption. Disclosure: I am a vehement anti-smoking advocate but try to be rational about it!! And lest it is not obvious, I am not an economist. Allan Main has 35 years experience in innovation and science management and is currently consulting in that field. 2 Padilla, J (2010): “The impact of Plain Packaging of Cigarettes in Australia: a Simulation Exercise” On line at http://www.smoke-free.ca/plain-packaging/documents/industry-responses/Plain_packaging_simulation_PMI_Australia_100202.pdf retrieved 16 August, 2012. 3 Reid, H (2011): “Analysis and review of J. Padilla, “The impact of plain packaging of cigarettes in the UK: a simulation exercise” On line at http://www.ash.org.uk/files/documents/ASH_801.pdf retrieved 16 August, 2012. The “no causal relationship” finding was based on the fact that the authors discounted *all* the qualitative studies because they “do not follow the recognized methods of statistical analysis, which are required to demonstrate a causal link in the social sciences”. And as no country had implemented plain packaging at the time, no empirical study was possible. So basically, “we can’t prove it works because it’s never been done, therefore we shouldn’t do it”. The evidence about warning labels in the Kelly-Gagnon/Chassin paper came from a 2004 study (alcor.concordia.ca/~irvinei/bep2004publishedversion.pdf). The study introduced a “dummy” variable to test the data – it looks like they’re simply asserting that the difference from “before” and “after” was statistically insignificant, even though the prevalence dropped quite a bit and the sample was very large. Can someone with expertise please have a look at that for me? I think they extrapolated from the lack of packaging effects for ‘explicit warnings’ to the ‘plain packaging’. So in that sense, we do have empirical data. Not an exact match, but in terms of trying to manipulate demand via packaging, perhaps close enough. Also the economic effects of plain packaging imply there is a risk of a perverse effect. Companies can exert a bit of market power where brands are recognisable, to get higher prices. (For example, certain well-known soft-drink companies selling fizzy, brown cola drinks are able to capture higher prices & profits because of ‘brand’ effects). Without a ‘brand’ to market, companies cannot set prices that capture their market power. Which would mean cigarettes could become cheaper, and consumption rise…not what we’re after. This suggests that we should have a pretty good case for plain packaging reudcing consumptioon prior to implementing it. If the dummy variable is insignificant, then they’re not asserting anything. They have demonstrated that whatever changes to consumption that have occurred, are not explainable by this variable. Rather other variables (often anti-consumption campiagns are associated with a raft of measures and there are consumption trends that persist) are better candidates to account for the change.